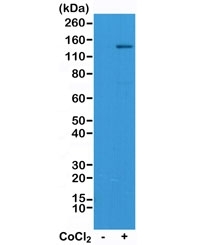 Western blot test of Jurkat cell lysate, untreated or treated with Cobalt Chloride (CoCl2), using recombinant HIF1A antibody at 1:1000. Routinely observed molecular weight: 100~120 kDa. IHC testing of FFPE human breast cancer tissue with recombinant HIF1A antibody at 1:1000. Limitations This recombinant HIF1A antibody is available for research use only. Reactivity : Human. Other species not known. This recombinant HIF1A antibody reacts to human Hypoxia-inducible factor 1-alpha. The stated application concentrations are suggested starting points. Titration of the recombinant HIF1A antibody may be required due to differences in protocols and secondary/substrate sensitivity. 1. A pH6 Citrate buffer or pH9 Tris/EDTA buffer HIER step is recommended for testing of FFPE tissue sections. A peptide corresponding to Hypoxia-inducible factor 1-alpha was used as the immunogen for this recombinant HIF1A antibody. Store the recombinant HIF1A antibody at -20oC (with glycerol) or aliquot and store at -20oC (without glycerol).